Investing: Fast gave some hints as to how we can explore the likely market impact of System 1 type of thinking about economies and markets. The long-term results, I think, speak for themselves, but they are the result only of cumulative short-term investment tactics. System 2 type investment thinking aims at improving longer-term strategic positioning, allowing a longer investment horizon, less costly in terms of day-to-day effort and cost. If the energy devoted to analytical and deliberative thinking about investment were easily repaid, the ‘strategic advice’ industry would be even bigger than it is. Conversely, and ironically, it is the very sustained failure of these attempts that keeps the industry afloat: if anyone ever managed to think their way to consistent investing success, they would keep very quiet about it. But the history of technology demonstrates that key breakthroughs often have multiple discoverers who enjoy the same Eureka moment quite independently of each other around the same time. So even the most determined IP lawyer would be unable to stop the market-busting breakthrough finding a wider audience. At which point, there would be no point in markets anyway, since everyone would ‘know’ the information the market discovers beforehand. So far, so negative. However, whilst no System 2 process will deliver a strategic method guaranteeing 100% success, there are economic tools which which quantitative analysis confirms do add value, systematically raising your chances of being invested in the right places at the right time. Here I’ll introduce two of them (albeit in conceptual terms only) which have survived the quant analysts’ autopsies: first, return on capital; and second, profits. Both sound not mere familiar but bone-headedly obvious: why would anyone think of investing in equities if they didn’t have a view on return on capital and profits? Answer: because they’re macro-economists, and macro-economics historically has been relatively incurious about returns and profits. Taken together these two not only help form the foundation of understanding where a particular economy is in its business cycle, but also, of course, builds a basis for comparison between the position and likely medium-term trajectory of other economies competing for your investment. 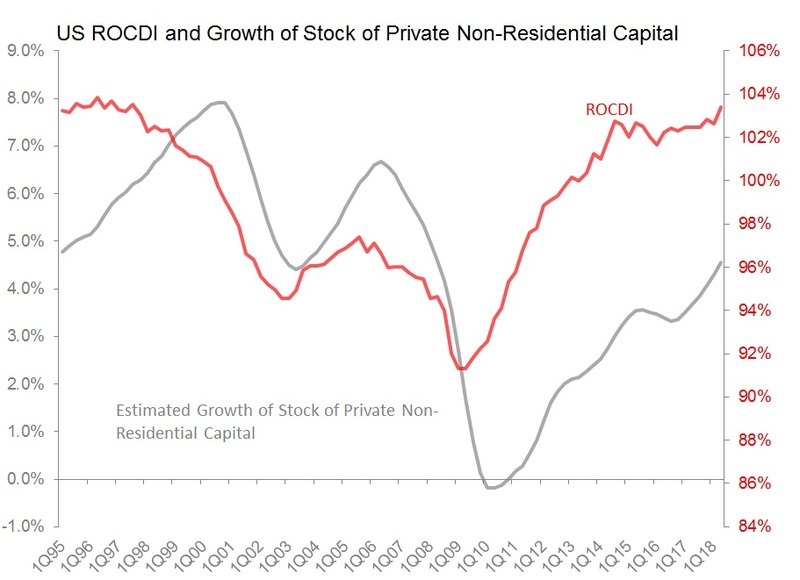 I construct a Return on Capital Directional Indicator (ROCDI) by treating GDP as a flow of income from a stock of capital, and as that income fluctuates relative to the stock of capital. This is a simple idea, in macroeconomics related to Incremental Capital Output Ratio (ICOR) and in equity research to the asset turns (Sales/Total Assets) element of the Dupont Analysis decomposition of return on equity. The key difficulty is estimating the size and growth of capital stock. I make an estimate by depreciating the gross fixed capital formation line-item in quarterly national accounts over a 10yr period. Whilst such a straightforward approach refuses to engage in a number of obvious (and interesting) questions, in practice the results concur closely with the results of more scrupulous surveys, where available. Crucially, these calculations are made using only nominal data (rather than real): ‘real’ counts of investment in capital goods seem to me to be hopelessly compromised by a) the issues arising from the Cambridge Capital Controversies; and b) the key characteristic of capital goods is that their price fluctuates dramatically with business cycle, but in balance sheet accounting terms they remain on the books at purchase cost. That difference between capital goods market price and book price is, quite obviously, a key element in the business cycle dynamics we want to understand. The result is that we can see not only the fluctuations in trends in return on capital, but also how investment activity fluctuates (and is likely to fluctuate) in response. Here, for example, is how it looks for the US. If the rest of the world’s saving position with the economy (ie, the trade balance in its wide description) changes, and everything else is held constant, corporate savings will fluctuated by the same amount. This is, in fact, nothing more than an economic accounting identity. To my knowledge, it was first articulated by a Polish Marxist-influenced economist Michal Kalecki in the 1930s, who initially used it to analyse the exploitation of the workers. Whilst it is not necessarily always easy (or possible) to calculate it with certainty, the results are extremely useful in observing the trajectory and force of business cycle dynamics.